Like every other pregnant person in the history of time, I was nearing a point of pathetic desperation. At 38 weeks, and so large that I once got stuck in my bathtub, my usually rational mind grew increasingly frustrated with science and simultaneously open to old wives’ tales: Pineapples (not too ripe), power walking, raspberry leaf tea, vomit-causing castor oil smoothies—anything to (allegedly) induce labor. So by the time the late-night note arrived in my inbox, it was weird but not that weird: “Try this recipe,” wrote a Facebook friend I hadn’t seen in a decade. Attached was a snapshot of torn crumpled paper, handwritten in scrawled pencil, for Eggplant Parmesan. Her husband, as it turned out, had overheard a gaggle of moms at a Toronto coffee shop discussing the recipe for sure labor. My friend had tried just a few bites, three days beyond her due date, and popped first thing in the morning (and in 44 minutes, no less). Still, she remains skeptical: “Psychosomatic, maybe, but desperate times,” she wrote. Since that last part is definitely true, and with nothing but more waiting to do, I probe her for more details on the recipe’s origin: Eggplant Parmigiana alla Scalini’s, an old-fashioned family-owned Italian restaurant in Cobb County, Georgia. Since 1980, the Atlanta suburban spot—via word of mouth and long before social media—has become a pilgrimage place for pregnant women eager to not be pregnant anymore. Manager Robert Bogino claims at least a thousand “eggplant babies” have been born after moms-to-be consumed his family’s famous dish. Photographic proof hangs in crowded collage form of adorable baby pics all over Scalini’s walls. His mother told her friends, who told their friends, and four decades later a half dozen women waddle in per night, says Bogino. In fact, the day we spoke, he got word of another eggplant baby born to Ana D’Arezzo, a 32-year-old new mom from Attleboro, Massachusetts, who heard about the recipe from someone at work. Hoping to pop on January 11th—the anniversary of her father-in-law’s passing, to bring life and joy back to the day—D’Arezzo whipped up two batches to consume the few days in advance. The dish worked too well: D’Arezzo was in labor three hours later and her son arrived on January 10th. Science, however, is pretty unconvinced. Studies are mixed, at absolute best, but many centuries’ worth of anecdotal reports are strong. “People have used herbal and dietary medicine forever,” explains Winston Cardwell, naturopathic physician and former chef in Atlanta. Besides eggplant, licorice, dates, pineapples, spicy foods, Mexican food, and chamomile are just some foods said to help induce labor. How much dairy and garlic exactly? Luckily—especially for me—Bogino’s recipe isn’t a kept family secret; it’s available by popular demand on their website. Begin with three sliced eggplants, skin-on for extra vitamins, breaded, and fried. 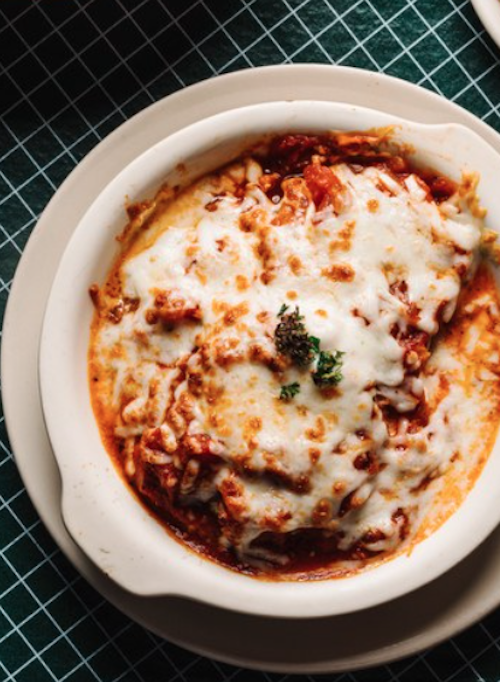 Layer them lasagne-style with cheese, cheese, and more cheese (Pecorino Romano, Parmesan, mozzarella, and ricotta) between marinara sauce. This, say some, is the magic part: two cloves of garlic, tomatoes, onions, and olive oil with spices galore (parsley, oregano, crushed red peppers, basil, thyme, and rosemary). Bake for 25 minutes in a 375 degree oven and then dig right in. Which I did, twice. It was a delicious cheesy mass enjoyed by all, followed by an early bedtime (just in case!) via cheese coma. Sadly still unsuccessful in the morning, I ate the leftovers for breakfast. Still no luck. I got a pedicure in a vibrating chair and ate another whole pineapple. And then, three and half weeks later, ten days post-due-date, and after many more failed efforts with castor oil and ball-bouncing and acupuncture, I gave up and got induced. Can’t win ‘em all, old wives.